Affordable 8-ink printer to produce durable prints. 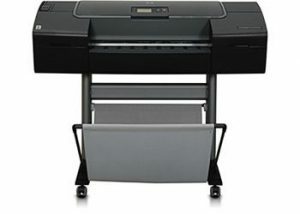 For rich, durable color prints at an affordable price, look no further than the HP DesignJet Z2100 Photo Printer. You get brilliant color that lasts up to 200 years. Included HP utilities provide hassle-free printing, maintenance, and color management. Whether you are interested in selling us 5, or 500 printers, wide format printers, and/or copiers our staff looks forward to assisting you every step of the way. We purchase used printers & copiers for CASH Français du Canada, Canon, Xerox, Ricoh, Konica Minolta, Toshiba, Sharp, Blueprint Printers, Blueprint Copiers, Savin Wide Format Printers, Savin Large Format Printers, Lanier Large Format Printers/Copiers, Lanier Wide Format Printers/Copiers, Océ Large Format Printers, Kip Large Format Printers, Used HP Designjet Large Format Printing, Used Kyocera Mita Copiers, Used Panasonic Copiers, Refurbished Xerox Large Format Used, Refurbished Ricoh Wide Format Copiers, Used Canon Large Format Printers/Copiers, Used Refurbished Engineering Printers, Used Kyocera Mita Wide Format Printers, Kyocera Mita Large Format Printers, Used Refurbished Canon Wide Format Printers, Kip Wide Format Printers, Used Océ Wide Format Printer, HP Designjet Wide Format Copiers, Used Ricoh Large Format Printers, Xerox Wide Format Printers, copy machines and Wide-Format & Commercial Printers, such as Toshiba, Ricoh, Canon, Sharp, Konica Minolta, Kyocera, Panasonic, and Used Copy Machines, Discount Copiers, Off-Lease Copiers, Digital Copiers, Office Copiers, Color Copiers, Black and White Copiers, Multi-function Printers, Wide-Format and Commercial Printers, Large Office Copy Machines, Used Canon Wide Format Copiers, Used HP Wide Format Copiers, Used KIP Wide Format Copiers, Used Lanier Wide Format Copiers, Used OCE Wide Format Copiers, Used Ricoh Wide Format Copiers, Used Savin Wide Format Copiers, Used Xerox Wide Format Copiers.